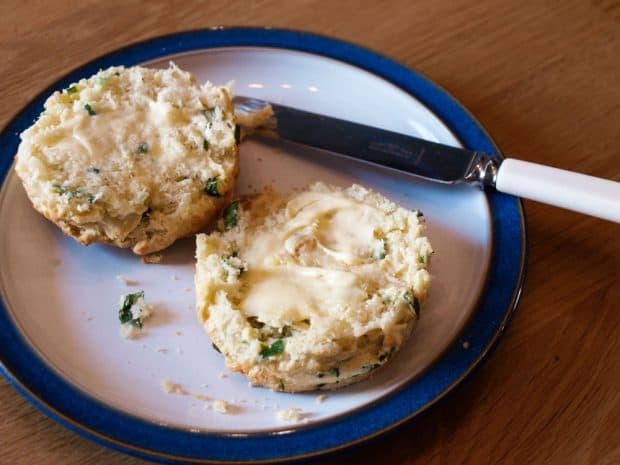 These delicious Pesto Potato Scones are great to eat warm with butter, they are perfect with cheese or to accompany a bowl of homemade soup and if the weather is good, it’s great to enjoy your lunch outside. It does feel as if spring has finally arrived, the days are stretching, spring bulbs and blossoms are bursting into bloom. 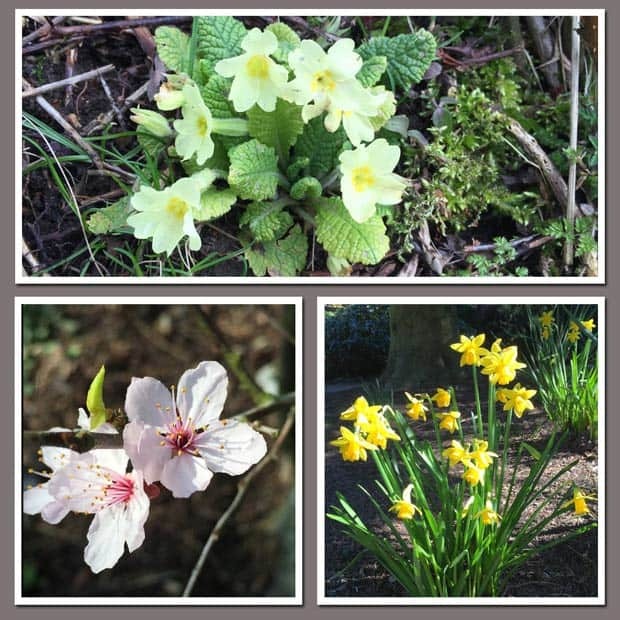 On a recent visit to the garden centre, I picked up some summer flowering bulbs, hardy annual seeds and some vegetable seeds for my garden, so spring is definitely here! I grew some fruit and vegetables last year and hope to grow more this year. The summer in Scotland in 2015 wasn’t very warm and only the hardiest plants survived, let’s hope it’s kinder this year. 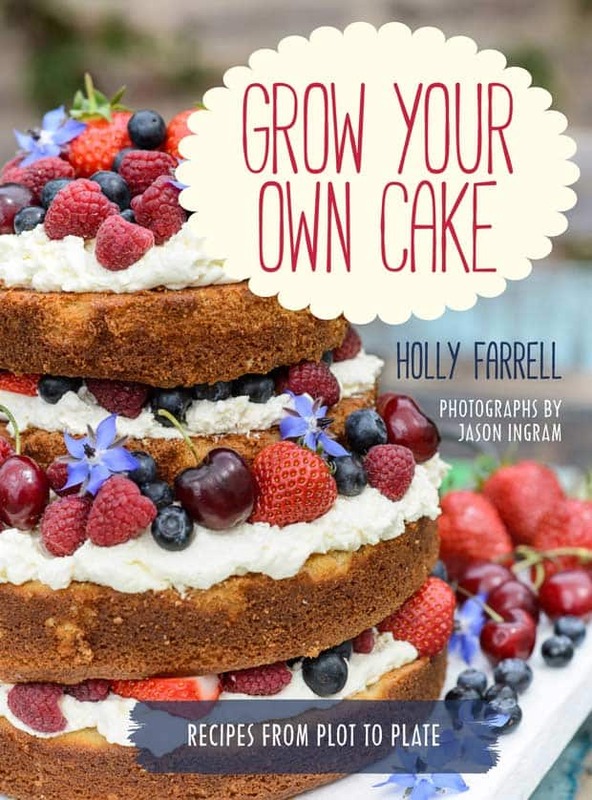 I was delighted to get the opportunity to review Grow your Own Cake by Holly Farrell, photographs by Jason Ingram, this book is designed for people like me who love to grow their own fruit and vegetables and also use that produce to make something delicious. Hopefully, the growing advice in this useful book will help me have more success this year. HOLLY FARRELL is a garden writer and freelance consultant on kitchen gardens for private clients. She is the author of Planting Plans for your Kitchen Garden (2013, How To Books) and RHS Plants from Pips (2015, Mitchell Beazley) and contributes to gardening magazines such as The Garden and Kitchen Garden. Holly is also a keen and experienced baker and has a blog at www.hollyefarrell.com. JASON INGRAM is an award-winning garden and food photographer. His previous published work with Frances Lincoln includes Kitchen Garden Experts, One Pot Gourmet Gardener, The Cut Flower Parch and The Crafted Garden. Jason was named Photographer of the Year by the Garden Media Guild in 2013 and 2014. I was impressed by the advice in the gardening section, it was no-nonsense and laid out in clear sections with bullet-pointed lists of instructions that are easy to follow. There are also step by step picture guides for key activities like sowing seeds. Moving from the garden into the kitchen, the same no-nonsense clear instructions with more step by step guides to help you make your bakes a success. For each plant, there is a Grow page, with all the growing advice and a Bake page with the recipe. For example, the Grow page for Courgettes (my nemesis last year) gives advice on best varieties, planting, maintenance and harvest. Turn the page and you have a recipe for a tempting looking Courgette Cake with a step by step photo guide as well as the written recipe. Standout recipes on my ‘to make’ list: Rhubarb Crumble & Custard Cake, Chocolate and Raspberry Bean Cake, Fennel Cake, Cranberry Couronne, Toffee Apple Cupcakes, Tomato Cupcakes, Lavender Shortbread, Roasted Plum Cheesecake, Pea Cheesecake and Pesto Potato Scones which I decided to make straight away. I had some Spicy Kale Pesto in the fridge and, as you need a lot of basil for traditional pesto, I made the Pesto Potato Scones from the Savoury Bakes section, using this alternative version. See the bottom of this post for more alternative pesto recipes and versions of potato scones to inspire you. The Pesto Potato Scones were really tasty, perfect to eat with cheese or with a warming bowl of soup. 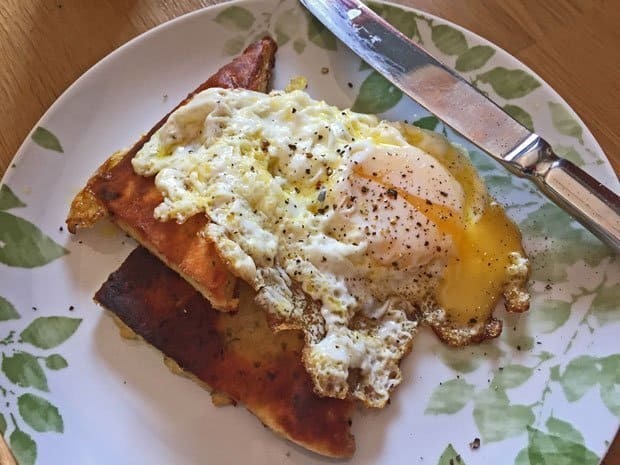 I also fried a couple and had them for lunch with a fried egg on top! Blend all the ingredients except the cheese into a consistent paste, then stir in the cheese and set aside. Mash the eggs into the potato with a fork, then sift in the flour baking powder and salt. Mash roughly, then add 150g/5 oz of the pesto and bring it all together to a dough. Reshape the dough and continue cutting out the scones. Bake for 20-25 minutes until risen and slightly browned. Remove from the oven and cool on a wire rack for 5-10 minutes. Tip the dough out onto a floured surface and flatten to around 3cm/1 1/4 in thick. Punch out the scones using cookie cutter and place on the floured tray. Reshape the dough and continue cutting out the scones. Bake for 20-25 minutes until risen and slightly browned. Remove from the oven and cool on a wire rack for 5-10 minutes. Serve warm, slathered with cold butter. I rolled my scones more thinly than the recipe suggests to make them more like traditional Scottish Tattie Scones, but if you cut them thicker then they will be more like the more usual scones. Who is it for? Grow Your Own Cake is ideal for beginner gardener and those with some experience and ditto for bakers. There’s always something you can learn, new plants, new baking ideas. I’ve had my own garden for over 30 years and have been baking even longer and I really enjoyed reading Grow Your Own Cake. Pros: The layout is excellent, very clear and easy to follow. The photographs of the plants and bakes are quite beautiful and totally tempting. 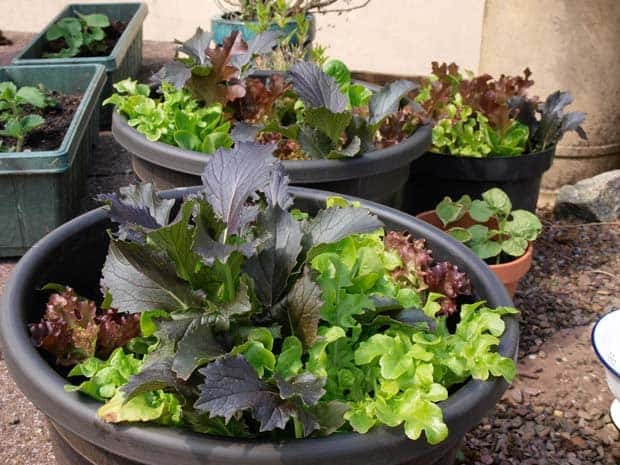 Cons: If you are a serious gardener who has been growing vegetables for years, then you may find that you already know the information in the Grow section, but even the most experienced baker will find something in the recipes to surprise and delight them. The Verdict: This would make a great gift for anyone with a passion for growing and eating the things that they grow, or you could gift it to yourself! I think it would be ideal for someone who has just got their first garden. I’ll be planting my seeds and plants very soon and definitely growing my own cake! We grow corn, cabbages, tomatoes, onions and kale. That sounds great, I’m hoping to grow kale this year. Got to love a tattie scone Janice and pesto flavoured ones sound lip smacking! Thanks Stuart, they were great fried with the egg on top. This year I will be growing potatoes, lettuce, tomatoes, raspberries, blackcurrants and not sure what else yet 🙂 I have big plans! Sounds like a great book that would be very welcome in my house! Gardening and baking being two of my favourite pastimes. It is lovely Lucy, very inspirational. Oh, those pesto potato scones look and sound delicious!!! And thank you for mentioning my pesto recipe as well. Thanks Margot, thanks for sharing your recipe with me. Thanks Camilla, your scone looks very tasty too. I’m so hopeless with growing products – doesn’t stop us from trying though! Those scones are just up our street – Would love to try with some chutney. Thanks Helen, your comment had gone into spam, so I had to retrieve it, seems to happen every now and then. Hope you have more joy with your garden this year. This looks awesome! I’ve tried pesto bread before, but not scones. Love the idea of growing your own too. Wish I was better at gardening! Thanks Lisa, lots of excellent advice in this book for improving your gardening! Sounds good to me Shaheen! Love tattie scones. Of course I hadn’t heard of them when I moved here from the US, but I quickly got a taste for them. And homemade are even better of course. Great recipe and interesting sounding cookbook. I guess every country has it’s own version of quick breads and we do seem to have a lot of them in Scotland! Baking from things I’ve grown or foraged is right up my street. Nice review and I love the idea of adding pesto to scones. There are lots of inspiring ideas in the book, not just the usual fruit and veg recipes. Just realised you’re running a giveaway on this. Have got to try my chances for this one. We’re really late as usual in getting our beds sorted out, but even if I don’t manage to grow all the things I plan to every year our garlic is doing well and I should manage beetroot, carrots, potatoes and runner beans. Anything else is a bonus. Sounds good to me, I’ve got nothing planted yet, too cold. That made me laugh Lorrane, we also grow a lot of brambles! Lovely idea, I’ve never made potato scones but they have been on my to-do list for a while, and this looks like a lovely recipe to start with! 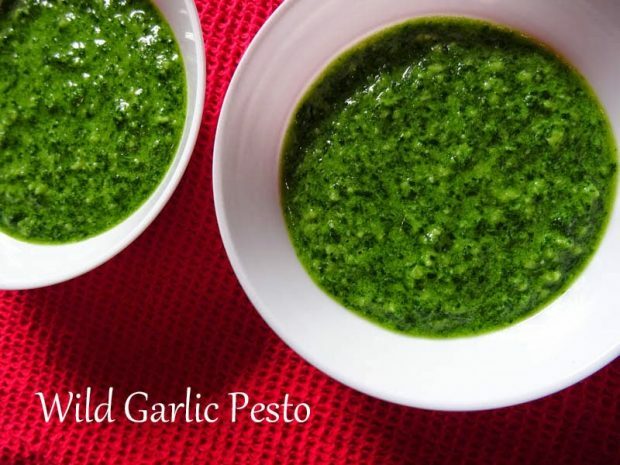 Great idea to use kale pesto, can’t get enough of it! Thanks Kate, I froze half the batch and we had them at the weekend, I think they were even better!